Seize the opportunuty to discover the southern part of the Italian heel and enjoy the typical Italian lifestyle surrounded by stoned walls, scrubs of Mediterranean forests and silver olive tree gardens that surround the old manor farms, thousands of trullo houses spread in the villages. An extra-ordinary itinerary off the beaten path that will leave you breathless. 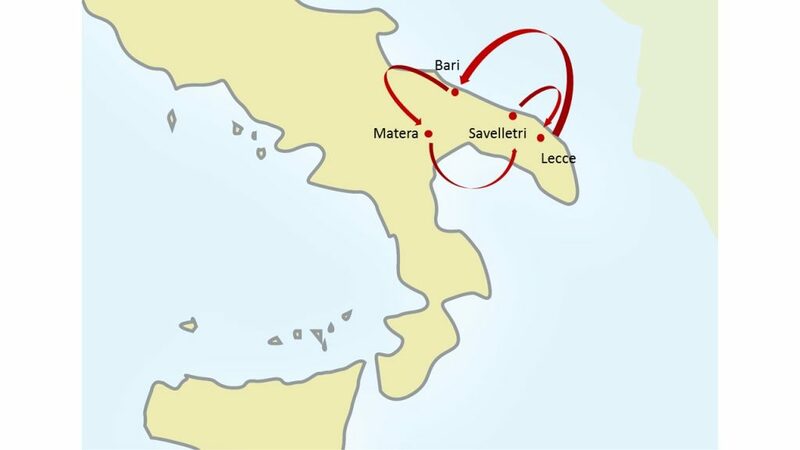 The tour features Matera, , Alberobello, Locorotondo, Savellettri, Lecce, Grottaglie and Ostuni. Start this unforgettable trip in Matera, Stone Town of Italy with its stunning homes built in the rock enjoying a food & walk tour in its narrow streets. Admire the beautiful and curious architecture of the houses in the towns of Alberobello and Locorotondo. Discover Lecce - the Florence of Southern Italy- through its food tradition with an exclusive Italian Cooking Class with an expert English speaking Chef and great dinner. Relax and enjoy the nature hiking and biking in Lecce & Ostuni countryside. LIKE THIS ITALY TOUR? You can customize. START HERE. Private sightseeing Tours with expert local English Speaking Guides, including all the entrance fees to the sites visited, with preferential skip the line access: Matera, Alberobello, Locorotondo, Lecce. Amazing hiking excursion in Ostuni combined with olive oil mill visit and exceptional tastings. Full day excursion to Grottaglie and guided visit of ceramics showroom. Exclusive Italian Cooking Class with an expert English speaking Chef and great dinner in Lecce. Full day bike tour excursion with pic-nic lunch included. All private transfers by deluxe van with English speaking driver avilable for transfers and excursions for the entire Tour (including airport/train stations transfers). Tour begins and ends in Bari. Start exploring Matera at your own leisure. Enjoy the magic atmosphere and picturesque landscapes of the Stone Town of Italy. Private guided tour of Matera, a UNESCO Heritage site: the whole neighborhood excavated into the rock, literally sculpted behind a deep ravine, an inextricable network of tunnels and buildings, literally one on top of the other. Experience the atmosphere of an Italian town: food & walk in the “labyrinth” of streets in the Sassi. Private guided tour of Alberobello designated as a UNESCO World Heritage site since 1996 for its characteristic cone-shaped homes, better known as the ‘Trulli’. Stop for lunch in the old town in a typical restaurant built in a “Trullo”, the building conical shape made of living stone dating back to 1400. After lunch Locorotondo. Listed among “The Most Beautiful Villages of Italy”, a white balcony in Murgia dei Trulli, closed into its circular perfection of stones and mortars: the white color wraps everything, it looks like flashing background of baroque architecture of local stones with the characteristic peaky roofs made of grey stoned “chiancarelle”, called cummerse. Full day amazing hiking excursion in Ostuni combined with olive oil mill visit and exceptional tastings. Private guided tour of Lecce, named “The Florence of the South” because of its wealth of art, its elegance and culture. Visit the historic centre and its monuments in the local Lecce Baroque style, with such a wealth of embellishment: the Cathedral and Santa Croce Church, a symbolic monument of Lecce Baroque period. Italian cooking class led by an expert chef: hands on teaching typical Southern Italian menu. Lunch with what you have cooked during the lesson. Full day bike tour excursion with pic-nic lunch included to enjoy and relax in the Lecce countryside nature.